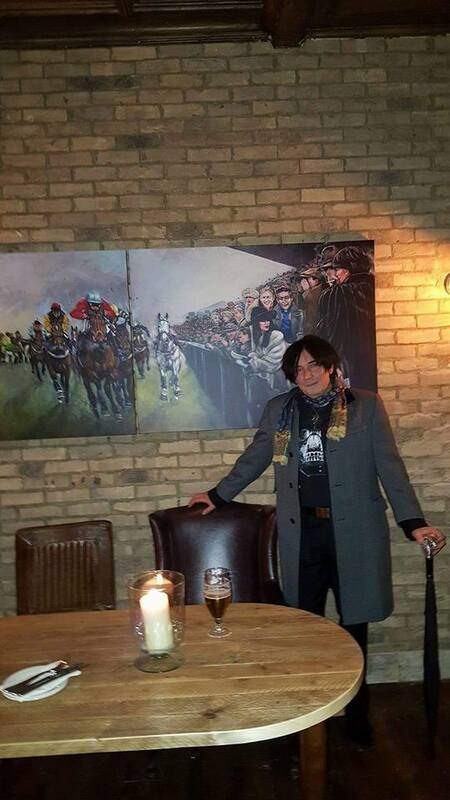 Artist David Dent with the Painting "Fellow Spirits: Kempton Park King George"
apparently irrational plan to raise money for alleged long term investment in the sport. The course they claim is financially profitable, so the need to do this must be offset against the loss of future revenue, potential revenue, long term value of revenue, and the role of the course in showcasing stars of the sport to the public and potential future racegoers at the important time of Xmas and other times. The course has been a showcase for stars such as Arkle, Desert Orchid, Kauto Star See More Business and many others and household names become such at times when families are together at Xmas; and Kempton Park is synonymous with this. So on rational financial, heritage and cultural grounds, not to mention environmental, (the course is in green belt and home to great biodiversity) , the decision makes no sense thus the Dents feel strongly about it and have been instrumental in the Campaign of Opposition #SaveKemptonPark. By February, the Campaign group had lobbied MPs and Alex Salmond MP had tabled an Early Day Motion. While these often don't see the light of day, it fired a broadside at the Jockey Club Executive that the public are not happy with their decision and question their fitness to continue while the plan remains on the table. Trusted to look after Racing, selling off the heritage and London's nearest racecourse is not the way to do it and sets a dangerous precedent. In March a commission came along through the prestigious Sampson Associates Interior Designers and Architects from Geronimo Inns who were refurbishing a pub in King's Cross London. The pub, in the heart of the newly refurbished King's Cross itself, which has kept much of its spirit of culture through the staging of Vintage Festivals etc., wanted to keep the spirit of its heritage. The Pub is associated with the racehorse The Fellow which won the King George VI Steeplechase at Kempton Park in 1991, thus that race became an ideal subject for the commission. The brief was to have a fun spirit, some risque goings on, vintage fashion, and of course the Francois Doumen trained horse ridden by Polish jockey Adam Kondrat - The Fellow - winning. As London is so closely connected with Kempton the King George victory was apt. David chose to apply a good deal of artistic license to tell the narrative of the race with Desert Orchid ad Sabin du Loir falling, Peter Scudamore and Richard Dunwoody getting to their feet, and the horses up ok. Desert Orchid was cheered home riderless by the crowd as the French raider won, Docklands Express in second, Remittance Man in third, Toby Tobias in 4th and Norton's Coin the Gold cup winner that year, in fifth. An exceptional roll call of great horses in a typical quality King George. So if you are ever travelling from King's Cross station pop into the pub and raise a glass to the Fellow, and to Kempton Park may it long continue to hold such prestigious racing.